Tearfund’s Global poverty prayer week (12-18 November 2007) pulls together thousands of Christians hungry to hear God and keen to be part of a miracle. We’re thinking and praying about issues of justice and poverty, and trying to create space to allow God to be working in our hearts and lives to change us and use us to change to world. Jesus make us your hands and feet in a hurting world. In the process of packing up all my stuff… I move out of university halls tomorrow. Still can’t quite believe thats me finished first year. It’s also pretty mind-boggling how much stuff you can acquire without realising it!! I sorta thought, because I’m a fairly organised/tidy person anyway, that it’d be quite straightforward and quick to pack… not so! Tomorrow my parents are picking me up, and I head back to Northern Ireland for about 3 weeks, before I’m off again! Mathematics 1Y this morning. Hard. 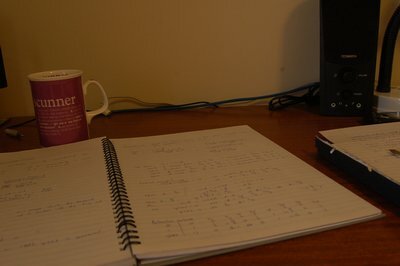 Computer Science 1P (Python programming) this afternoon. Pretty good. Off to my bed to try recover. See you in a while! This is my life right now… my coffee mug says it well… scunnered. I’ve been doing a fair bit of research on climate change lately as it’s been a focus for us as social action team at GUCU. 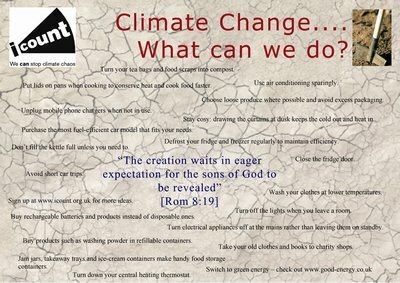 I put together a short powerpoint-type thing with some of the biblical basis for why we should care about which we showed at CU last night, and then gave out some flyers with practical steps we can take. Thought I’d post the flyer up here, click for a larger image. Sign up at icount for some more ideas, and check out Tearfunds stuff… they have a really good booklet called For Tomorrow Too which I used a lot. Most of you know I’ve ended up leading/guiding the social action team we have in CU this year. One of the things we want to see happen is for Christians to begin to understand that there is no real distinction between social justice and evangelism… the one is the other, and vice versa. Rob thought about it for a minute, then realised the answer was, we already are. He came to the realization that the question is not when do we teach them about Jesus, but what are we teaching them about Jesus. By the way we live out our lives and interact with others we are teaching them something about the nature of who Jesus is and what he is about. We are actually “telling others about Jesus” in a myriad of other ways, all the time. The gospel is not just something we verbally tell people. It is a way of life. If we only ever “share the gospel” through our words alone, it gets disembodied. It is meant to be lived out in the way we spend our money, love our neighboor, do our washing, take out our rubbish… everything.